Did you know that OpenText™ Captiva transforms electronic and paper documents into application-ready information to support modern workflows? By combining intelligent enterprise capture with process management, Captiva helps automate document-intensive business processes from start to finish. To do this, Captiva rapidly captures, extracts, and delivers information from electronic or paper documents to key processes or systems. By improving data quality at the point of capture, you can reduce operating costs, error and risk – and increase customer satisfaction. Plus, Captiva provides tools for easy mobile capture integration. You can deploy capture-enabled mobile applications with no or minimal customizations using Mobile Capture Toolkits; and quickly build capture-enabled mobile applications from ground up with Mobile Capture SDKs. Document capture offers what many industry leaders define as the fastest and most reliable ROI in all of EIM. Join us in this session to learn more about OpenText’s capture solutions and hear real-world examples about how these solutions deliver significant benefit to organizations by reducing costs, accelerating document-based business processes, and improving accuracy and compliance. 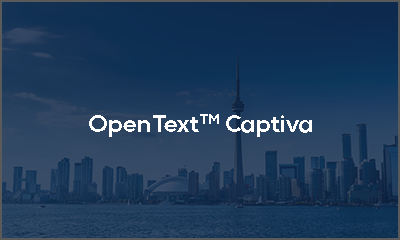 We will also explore how OpenText is raising the bar by applying proven machine learning and AI via Magellan as well as advanced reporting and analytics through iHub, further automating the capture process and improving your business performance. From Employee Onboarding, New Account Opening, Invoices, Contracts, Claims and more — we’ve all experienced pain points with capturing and processing documents — especially when wet ink signatures are needed. There has be a better way, and, fortunately, there is: With Captiva and Magellan joining forces. In this session, we’ll walk through best practices for capture, classification, and delivery into your back-end systems — while showing a live example of how simple it can be: snapping a picture directly from a smartphone. From there, we’ll demo how the intelligent document classification magic works through Magellan, and ultimately how to show results to prove the value. Over the past year, we’ve release two new versions of Captiva Capture plus new versions of all the other Captiva products. This session will highlight the advances we’ve made and will also discuss Captiva’s future direction, including some of the innovations coming soon. Specific products to be covered include: Captiva Capture, Captiva Real-Time, Captiva Mobile SDK, Captiva Web Client, Snap (our cloud-based capture service), Snap Mobile, and Capture Services (cloud-based capture APIs). Flatirons Digital Innovations designs, develops, implements, and supports document capture solutions using OpenText Captiva. Learn more.